When is a tax a job killer? Ask the medical device industry. One of the many taxes used to fund Obamacare is a 2.3% tax on the sale of medical devices. The tax went into effect in 2013 but was suspended in December 2015. This is tax on sales, not profits. A medical device startup that isn’t yet profitable still had to pay the 2.3% tax. Small and medium-sized businesses make up 91% of the medical device industry, according to the American Action Forum. Government data compiled by AdvaMed, which represents medical device makers, shows that thousands of jobs were lost while the tax was in effect. 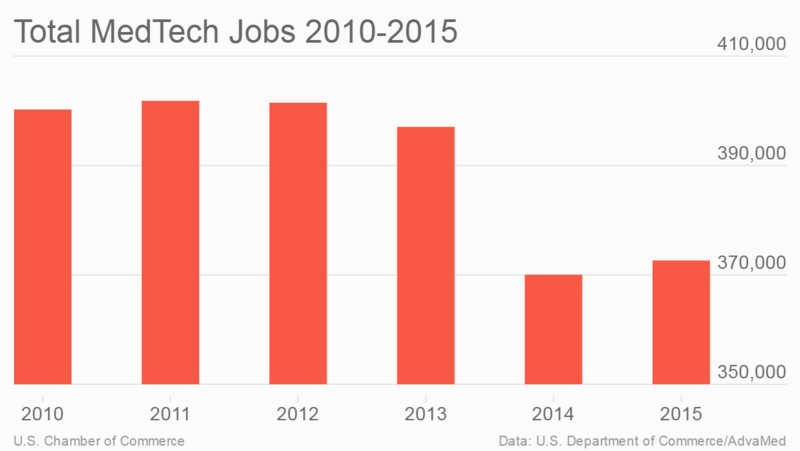 From 2012 to 2015 the number of medtech jobs fell by almost 29,000. The decline started in 2012 when companies were preparing for the medical device tax to go into effect and then accelerated in 2013 and 2014. 23% reported increasing investment in start-up companies. The lesson here is simple: Taxes can cost jobs, investment, and economic growth. The medical device tax is only one of a number of Obamacare taxes that must go. The Health Insurance Tax and the Cadillac Tax also need to be repealed to make health care less expensive and improve quality.